« Newer Stuff First-Chapter Fiddling: Yea or Nay? 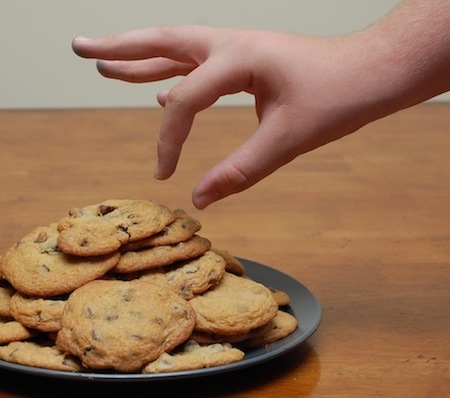 Hold on cookie fiend—you have to finish that chapter first! As I sat hunched in my dank writing grotto, and tried to figure out a way to move my mouse so that the 40-pound chains that kept me at my desk wouldn’t rattle so, I pondered the rewards of writing. No, no, not those tinhorn rewards like a Booker or a Pulitzer or a Nobel, where you are forced to podium-prattle about authorial intention while you die inside over errant exposure of your nose hairs to the functionaries seated below. No, too tedious those rewards—I turned them all down, a polite click on the phone. I know you are champing at the bit to know whether it’s the lady or the tiger (or the tequila or the cookies), and one more click will do the trick: see the rest of my post courtesy of the fine folks at Writer Unboxed. This entry was posted in writing inspiration, writing tools, writing whimsy, writing work and tagged cookies, F. Scott Fitzgerald, T. S. Eliot, tequila, Walt Whitman, writer rewards, writing rewards. Bookmark the permalink. But I’m already here, you matryoshka maker you. I know—it is kind of weaselly to push a reader (especially such an astute, loyal and strikingly handsome reader such as you, Joel) to another site moments after he lands on your own. Saw that in the comments. Madness. A reward should be, well, rewarding. I guess if you find getting nature all over your hands and the knees of your jeans rewarding, go for it. Then come to our house and go for it some more. I’m trying to move away from food rewards. I’ve been rewarding myself with food for 40 years, and have managed to reward up an average of 2.5 pounds per year. Maybe I’ll reward myself with chapters of Craig Johnson’s latest Longmire mystery. Low calorie, high intensity, and even adds value to my writing. Yeah, the food rewards can be a problem. I rewarded myself with ice cream last night. And then I rewarded myself for that first reward, with more ice cream. Ice cream is love, right? Not familiar with Mr. Johnson’s work. Yikes, my “to read” list is now longer than my life expectancy, I expect. But I suppose it’s a decent problem to have. I’m considering a shirt that says “Keep back 300 feet” for when I’m working. The characters in Longmire talk like cops, which means the profanity is thick as molasses, but the stories and the characters are also thick with chocolaty goodness. No idea what prompted my bizarre comment at WU. Diet, perhaps.